Please note Online Beng Seng counter is in the Meeters and Greeters Hall once you get through immigration. 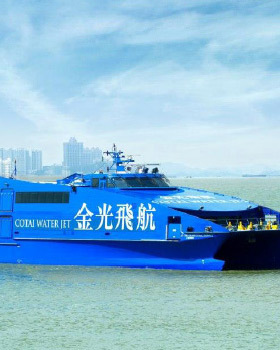 Cotai Water Jet offers an easy, convenient way to travel between Hong Kong/Kowloon and Macau. When collecting your iVenture Card from the Online Beng Seng counter at the airport, take the opportunity to purchase ferry tickets to Macau at 15% off with Cotai Water Jet. This exclusive offer only available to iVenture Card holders. Ferry services operate all day every day roughly every half an hour ensuring maximum convenience when travelling to and from Macau. 15% Discount offer only available from Online Beng Seng airport counter A13.